First Nations communities have alleged that toxic pollution from oilsands operators is contaminating their air, water and food. Representatives from industry and the federal and provincial governments have pointed to research suggesting the toxins aren’t yet at unsafe levels. Environment Canada has sometimes declined requests from journalists asking for interviews with federal scientists doing this research. But the anticipated study described by Chief Adam would follow a provincial government report, released in March by Alberta’s chief medical officer, James Talbot. The provincial report confirmed warnings about high rates of a rare form of cancer from a local physician, Dr. John O’Connor, who had been criticized for publicly drawing attention to the cases in the community of Fort Chipewyan. The provincial government confirmed levels of bile duct, cervical and lung cancer in the community, between 1992 and 2011, that were several times higher than expected. But the report also found that the overall number of cancer cases was 81, and therefore not significantly higher than the expected total of 79 cases. Bile duct cancer can be linked to a number of factors such as family history or exposure to some toxins. Talbot also confirmed at the time that there were never any comprehensive studies in the potentially affected communities. O’Connor said that nurses and doctors in the community may see things differently. 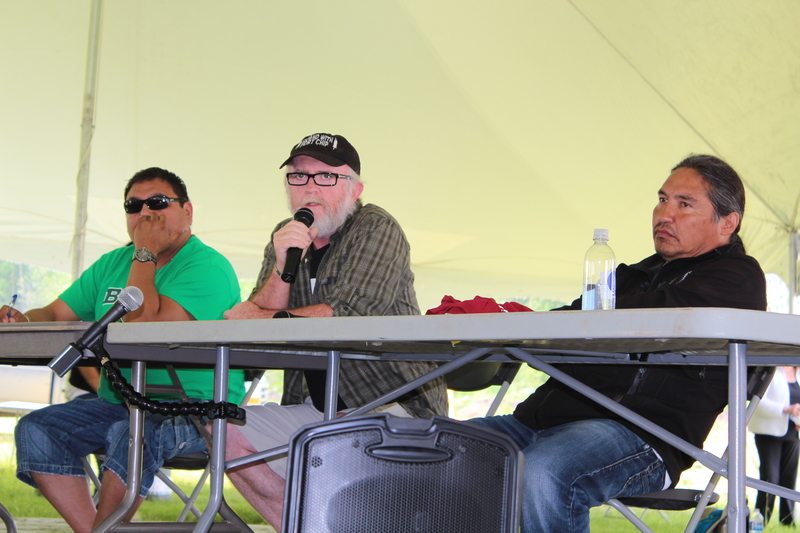 “The proof is up there if anyone chooses to look,” O’Connor said in an interview after participating in a panel discussion with Adam and George Poitras, the CEO and a former chief of the Mikisew Cree indigenous First Nation. Several hundred people from Canada and the United States travelled to northern Alberta for the outdoor weekend retreat – described as a “Healing Walk” around oilsands operations for First Nations communities affected by the industrial development. This is the fifth and final edition of the walk, a 20 km trek scheduled on Saturday. The event’s website said organizers would shift their focus in subsequent years away from open-pit oilsands mining to raising awareness about impacts of other forms of oilsands extraction that use steam injected deep underground. Chief Adam said in an interview that the University of Manitoba study would likely be released within a month with findings that would raise questions about the credibility of the Alberta Health report on cancer in Fort Chipewyan. O’Connor warnings drew official complaints from government officials, provoking a professional review that would eventually clear him. “I didn’t expect the reaction that I got. I didn’t expect to be attacked so viciously, when I chose to do my job,” he said. O’Connor said this is why he has no regrets. But he wonders whether government officials feel the same way. This entry was posted in muzzling, oil and gas and tagged Alberta, Allan Adam, Athabasca, bile duct cancer, cancer, Cree, Environment Canada, federal government, First Nations, Fort Chipewyan, George Poitras, Healing Walk, James Talbot, John O'Connor, Mikisew, oilsands, tarsands by Mike De Souza. Bookmark the permalink. Scientists do often disagree with each other. But which would you believe? The one paid by the Oil Companies or the one doing the research for the good of the community? I know which one I would believe and it would not be the Oil Company scientists.